Pranksterz came to us to discuss how their app could be improved. Having originally launched the app in 2009, the Pranksterz team wanted to re-invest into the app to bring it back to life. New competition in the market with more modern offerings. The Pranksterz team not re-investing in improving the app since its original launch and that. The app having no social sharing functionality, meaning there was no community engagement for Pranksterz to leverage. Our challenge was to re-invigorate the Pranksterz app for iOS with new features and functionality that help to boost app sales. The original brief was to add social sharing functionality, however our team felt that to truly improve upon the app, it needed to be re-thought from the ground up. The existing code base was a near write off, the user experience was difficult and the design of the app was outdated. We overhauled the app, from UX and UI to visual design and build. We looked at the way users interacted with the existing experience and noted down issues they had using the app. 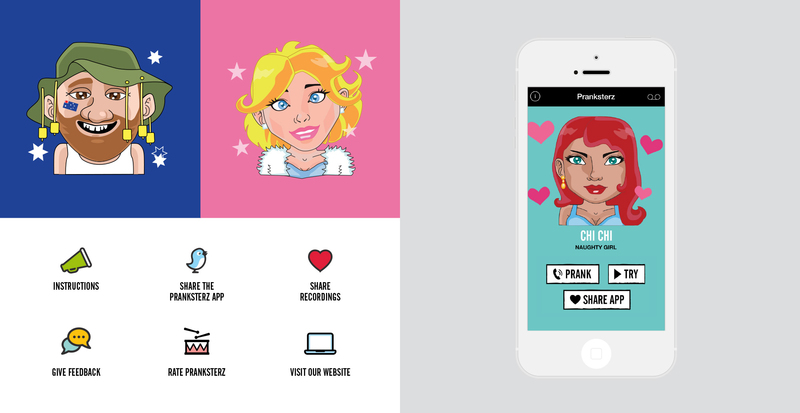 We implemented a beautiful new design that brought each Pranksterz character to life. We also gave users an easy way of exploring the range of Pranksterz characters on offer. A key usability improvement was to give users the ability to try a character’s soundboard before purchasing that characters script. From a visual standpoint, we wanted each element of the app to be inline with the cartoon style design of the Pranksterz characters. With the new social sharing functionality, Pranksterz needed a strategy and platform for engaging users, enabling them to build a community around fun prank-related content. We worked with Pranksterz to set-up and optimise their social pages on Instagram, Pinterest, YouTube and Facebook. This enabled Pranksterz to drive users to their social platforms to create and share content, expanding the reach of the Pranksterz app. Our plan included how often to post content, the type of content to post, influencers to leverage and more. Our team felt it was important from a strategic view to have a simple one page scrolling website that allowed users to experience Pranksterz prior to buying and downloading the app. We designed and built a custom website that featured key information about Pranksterz for example, its characters. This was an essential element to being able to better market the Pranksterz app and drive further exposure and app sales. 100% increase in sales with continued month on month growth since re-launch. Beautiful new user experience and interface that enables users to interact with the Pranksterz characters. Established community platform and engagement strategy. Significant increase of in-app purchase revenue, better in-app conversion.